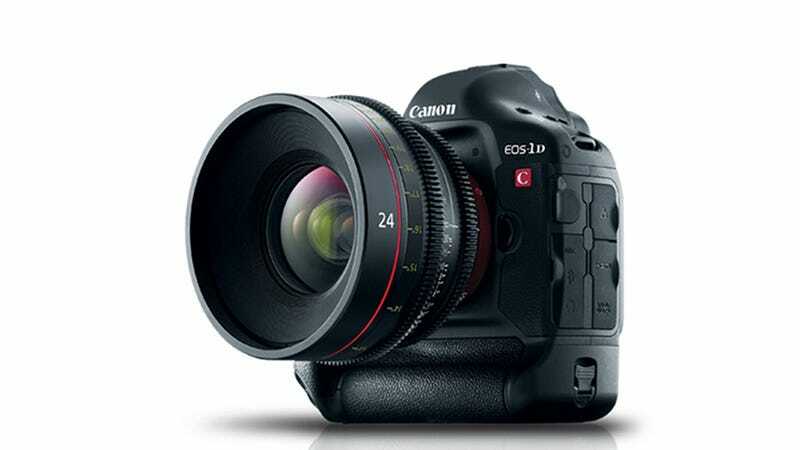 The Canon EOS-1D C is the 4K DSLR that many filmmakers have been clamoring for. It costs $15,000, which means you can't afford it. Bummer? Hardly. Canon's paving the road to a beautiful super-high-resolution future. Get excited. When we first got a look at Canon's 4K DSLR concept in the fall, we were cautiously excited. It's undeniably neat technology, but we knew it would be outrageously expensive, and it's not tech that's meant for your average consumer. Make no mistake: the 1D C is targeted squarely at pro filmmakers. While most DSLRs only shoot Full HD 1920 x 1080-pixel footage, the 1D C can shoot at up to a whopping 4096 x 2160 resolution. That's currently really only useful for high-end productions that are going to be screened using expensive 4K projectors. Films like The Social Network were shot in 4K. Your friend's indie flick? Probably not. As for the broader utility of 4K footage: Even though companies like Yamaha are "future-proofing" their home theater gear to make it 4K compatible, there just isn't a use for it yet in your home. There aren't any 4K displays out there you can buy. But Canon's less-heralded recent release is doing its part to urge the transition along, as well. Its new "industrial" 30-inch 4K display, being shown off at the National Association of Broadcasters Show in Las Vegas this week, is for Hollywood, sure. But it's only a matter of time until that tech trickles down to the masses, at a reasonable(ish) price.